Since the dawn of home computing, human beings have had a love-hate relationship with computers and all related technologies. We’ve loved what they can do for us from entertainment and productivity standpoints, but the minute something goes wrong, we’re ready to break out the Sledge-O-Matic and go all Gallagher on them. Still, sometimes a computer error can transcend aggravation and tickle our funny bones. Here at Intertech.com we’ve seen some pretty funny error messages in our times and in the cases of these 15 Funniest Real Computer Error Messages, it’s a tad hard to stay angry. So there you have it: actual problem with no known solution, but it’s one that the techie layman is unlikely to experience. While knocking around his Xbox One, Twitter user @getB3NT encountered this error message and sent it along to the gaming news site Kotaku. “Choose something else to play,” the message commands. “Because of your past behavior, you can’t Xbox Live Gold is required to use Skype for Xbox One.” This spiel has all the hallmarks of a message that was created in a non-English-as-a-first-language culture, and we find it particularly amusing that the system sounds none-too-pleased with its wisenheimer owner. 3. WinSCP – FTP Or Child Killer? One imgur user received the following error message from WinSCP and was able to grab a screenshot for posterity. The message starts simply enough with a boring, “Connection failed. / Disconnected from server,” before moving on to the big reveal in the last line: “OOPS: child died.” It didn’t take long for commenters to get in on the “fun”: “every time your FTP fails Windows kills a baby,” “Ironically, the child died from a crash,” “Good Guy FTP, kills child on accident, offers Help,” etc. We’ve got to admit to being at a loss as to what this error message is getting at, or how it’s triggered, but we’ll certainly be holding our little ones a little tighter next time we’re using WinSCP. The Linux operating system has long been a favorite of tech-minded people for its open source customizability. One of the many features that it contains that Apple and Windows users must do without: the ability to enable insults. This way, if you’re entering your password on a Linux OS, it can say things like, “Are you on drugs?,” “You do that again and see what happens…,” and “Speak English you fool – there are no subtitles in this scene.” But it doesn’t confine its colorful language to just wrongly entered passwords. As one Reddit user pointed out, it may also call you a Bonehead for checking a live file system. Anyone who’s borne witness to the comedy classic Office Space should get this reference immediately. Spiceworks, an Austin-based software development company, is likely to flash this error message your way whenever you use an outdated browser (at least, outdated as in IE 7 or 8). Note the attention to detail with the Bill Lumbergh cartoon rendering. And the message itself reads as if it could have come straight out of his mouth. 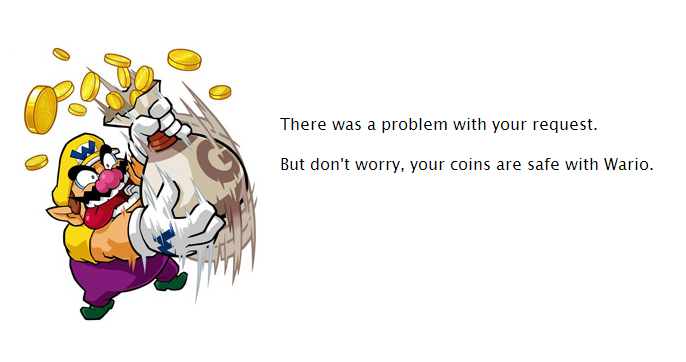 Nintendo eShop does a fun bit of brand customization when informing users of a foul-up. As Mario fans know, Wario isn’t exactly the most trustworthy guy in the Nintendo canon, and he’s probably the last character on earth you would want watching your digital fortune. Match that with one of the most comically evil faces we’ve ever seen, and this is one error message at which it’s impossible to be angry. So, printing is not supported on a printer, eh? 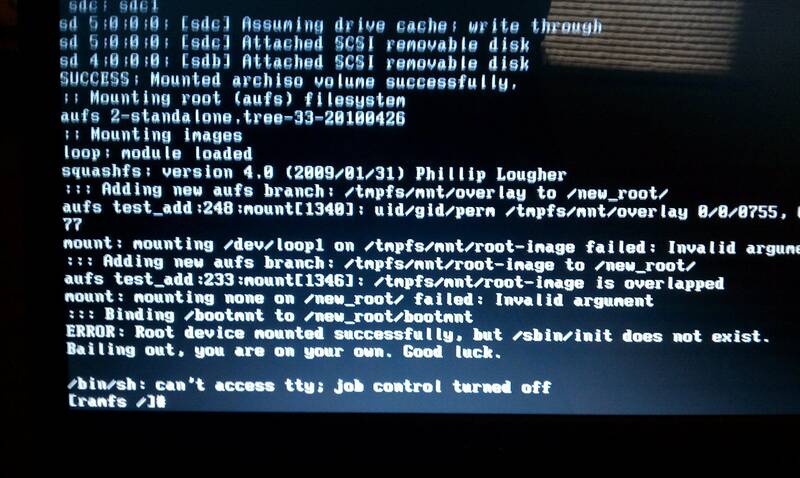 This error message comes from an Imgur user utilizing the Ubuntu operating system and involves an undisclosed printer type, thus making it hard to tell what triggered it and whether the issue still exists. However, for the sake of laughs, we’re glad it happened. 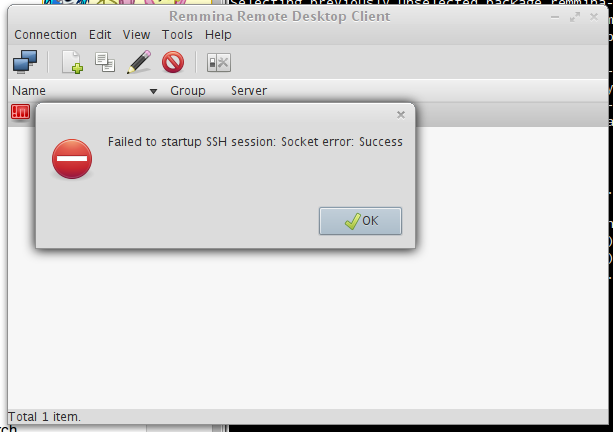 This error also occurred on the Ubuntu OS and involved use of the Remmina Remote Desktop Client. For the most part, it’s a pretty straightforward error message until you get to the end and have to do a double-take. After all, it’s not often you see the words “error” and “success” within two spaces of one another. We’re willing to bet though that this one turned out more the former and less the latter. 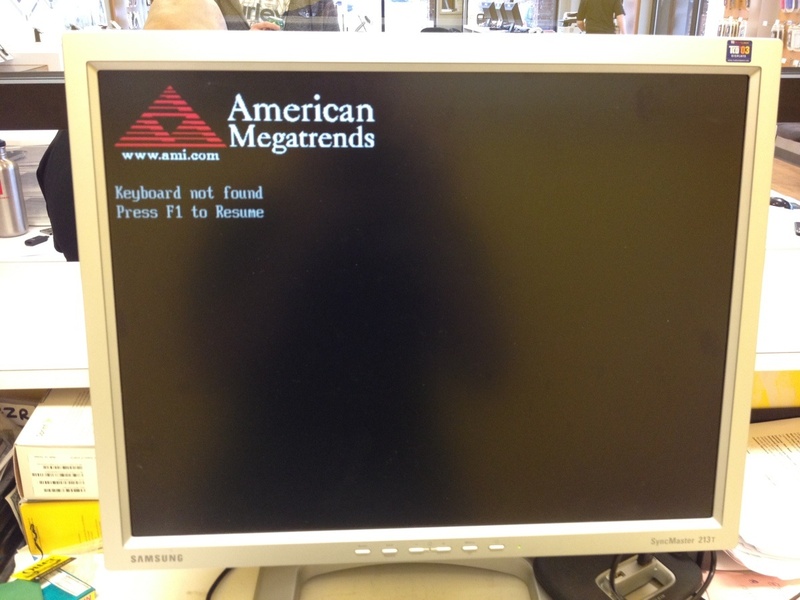 An employee of US-based hardware and software company American Megatrends Incorporated shared this error message on the Imgur site. AMI typically specializes in PC hardware and firmware, but here, their systems seem unaware of what it means when a keyboard isn’t present. Good luck hitting that F1 key! This was an error message that originally gained popularity on Reddit. The poster did not specify the operating system he was attempting to use. Apparently, it was the type that gave up at the first signs of trouble. When you drill down past the programming language, you’ll find this little gem: “ERROR: Root device mounted successfully, but /sbin/init does not exist. Bailing out, you are on your own. Good luck.” Nice. Not entirely sure what this Redditor was doing (or where he was doing it) to get this message, but it looks like he may have been up to no good. As noted in the error message, this page often displays when one is trying to perform a function for which they’re not authorized. (Hackers, for instance.) 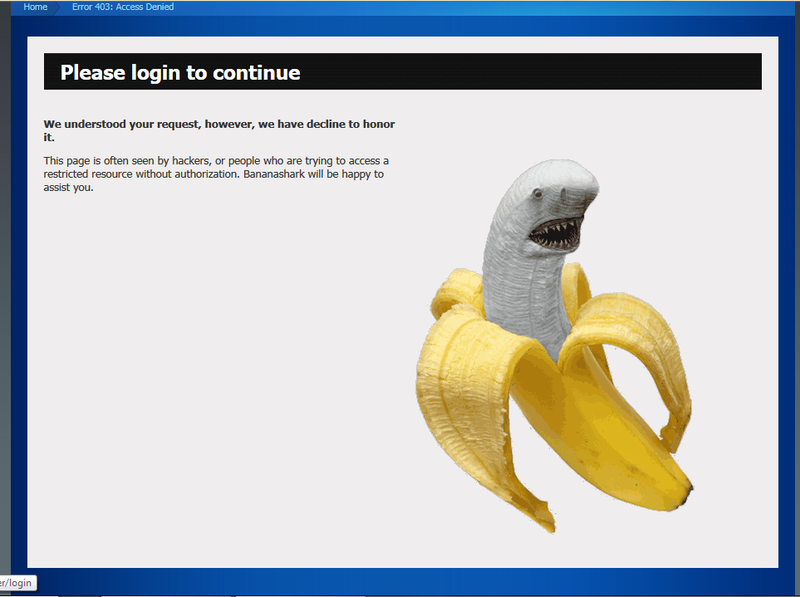 Regardless of whether it was an innocent mistake, we would not want to feel the wrath of Bananashark. 14. What Do You Mean, Not Enough Disk Space? Programmer Martin Rubli was not pleased with Windows Vista from the very beginning. On his blog, he takes an in-depth look at the operating system and rips it to shreds for its stability and usability issues. While we’re all glad Windows has moved on to bigger and better things, we do still kind of miss some of the head-scratchers Vista would throw our way. This example Rubli provides is a textbook classic. 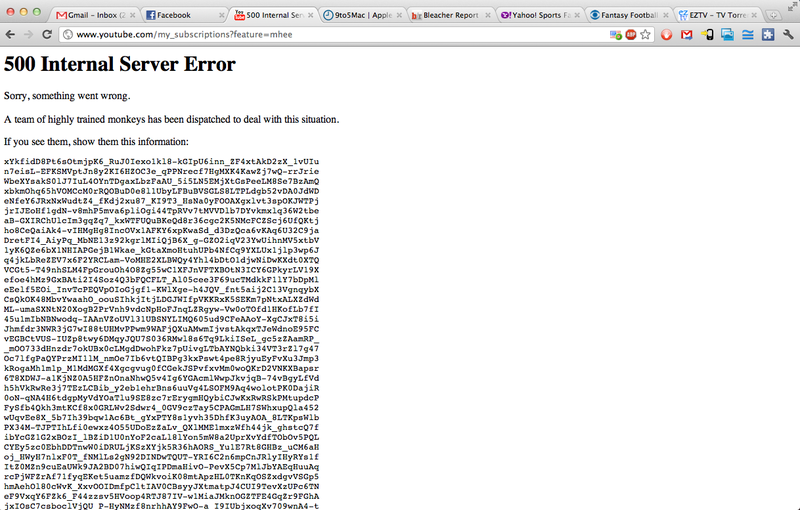 We’re not sure what this Imgur user did to break YouTube, but we do know there is no need to worry. The monkeys got this! This issue pertains to an internal server error rather than something of user error (i.e. typing in a non-existent URL). If you do something wrong on the site, it’ll give you the frowning red television set – cute, but not as funny. Which of these computer error messages did you think were the funniest? Which ones should we have included on the list? Sound off in the comments section below! Subscribe to our blog and gain access to our guide developed by our consulting teams. Some ad blockers can block the form below. Check your email for subscription confirmation - Your checklist will then be delivered. Practical insights, tips, tutorials and examples from team of software development consultants and trainers. Every Friday we send that week's content from our Developers via email. Try it out!